Some very nice church members gave us some venison they had processed recently. I had never prepared venison before and wasn’t sure what to do with it. I thought it is probably best done similarly to beef and stroganoff is one of my favorite beef dishes. 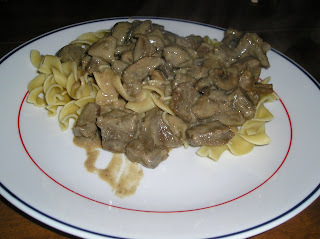 I had made beef stroganoff once a few years ago but we didn’t care for it that much. That recipe had red wine in it and the wine taste really came through in the finished dish. We didn’t really like that. So I knew I wanted a recipe that didn’t use wine. I wanted one that had beef broth and sour cream. 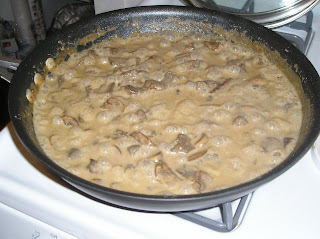 There were a handful of venison stroganoff recipes on allrecipes.com, but most of them called for cream of mushroom soup instead of beef broth and sour cream. And most of them didn’t even have mushrooms in them. Sorry, that’s not stroganoff to me! So I came up with my own recipe. Season venison with salt, pepper, onion powder, and garlic powder. 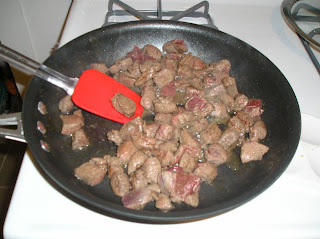 Brown in large skillet. When no longer pink, add ½ cup beef broth and the mushrooms. Cover and simmer on low until mushrooms are tender, about 15 to 20 minutes. Sprinkle in the flour and stir until well-mixed. Allow to cook for a few minutes. Add 1 cup beef broth and bring to a boil. Meanwhile, boil noodles until al dente and drain. When desired sauce thickness is achieved, remove from heat and add sour cream. Serve stroganoff over egg noodles. It was really good! I had some trouble coming up with the right thickness for the sauce. I wasn’t totally sure how thick I wanted it. 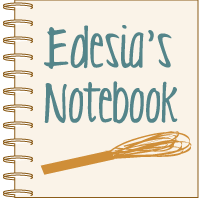 I kept going back and forth between, “It’s too thin,” and “It’s too thick,” while I was cooking. My roux didn’t thicken up very much, and I think that might have been because the venison was so lean that there was hardly any fat in the pan when I did it. But it ended up turning out really well. The venison had great flavor. Jim said he thought it tasted just like beef. I could tell that it wasn’t beef, but I thought it worked really well in this recipe. Some reviewers on allrecipes.com suggested marinating the venison before browning to tenderize it, but I’m glad I didn’t worry about doing that because the venison I had didn’t need it. This was a wonderful dinner. I will definitely be making it again, with beef too. Thanks for the venison, Tim and Christy!